How does an Android Tablet with 4G LTE and Android Oreo actually Perform? The Chuwi Hi9 Air is a 10.1-inch 2k fully laminated screen tablet running Android Oreo out of the box that also supports 4G LTE for calls. The device is now up for preorder on Banggood till April 19th and it will be available to ship from the 19th. So you can still grab it with a discount at 199 dollars, the price will go back to the suggested retail price of $239 when the preorder ends. 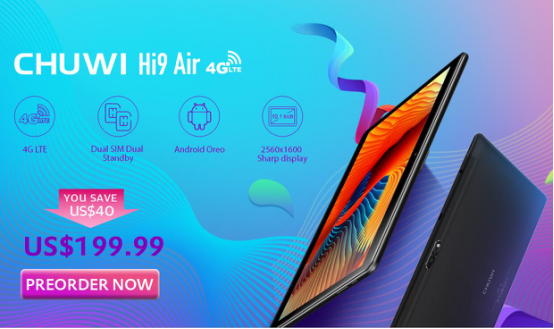 For those who aren’t too familiar with the Hi9 Air yet, the tablet is powered by a Mediatek Helio X20 deca-core CPU along with 4GB of RAM and 64GB of internal storage that is expandable. The device also sports a massive 8000mAh battery, two speakers placed on the sides and it supports a global ROM that will be updated via OTA. Google Play is also available along with a wide selection of languages. The case cover to protect your Hi9 Air will be up for grabs by the end of April. If you want to see the Chuwi Hi9 Air in action, then check the video below.